" Old Abandon Camp Today " I took 2 pictures and Found a Large white Orb In Motion ! 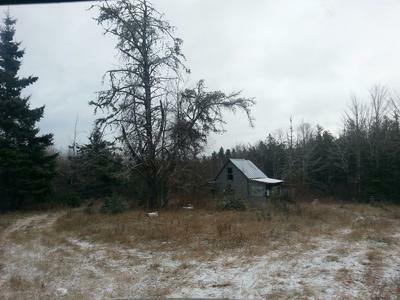 I was drawn to this old abandon camp in the woods of New Brunswick Canada, We were Deer Hunting and I was insisting we stop and drive into the camp its run down and I wanted to take a picture , here is what I found . In one photo it is normal and clear in the second picture which I took right after the first a second or 2 after it shows a large moving orb , I feel when I zoom in that I see a mans face . I would love to know what everyone else feels about this as I'm baffled by it . Thank you , Heidi .